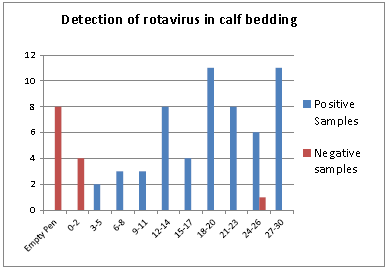 One aspect of the calf scours that applied to both farms was the importance of mixed infections. And while acknowledging the presence of both infections (rotavirus TypeA) and cryptosporidiosis, the scope of the research may have limited the interpretation of how important, or relevant to the results such combined infections may have had on the clinical signs seen. In unpublished work, David & Millward (2005) report that mixed rotavirus and cryptosporidial infections complicates the interpretation of the time sequence from infection; the appearance and severity of signs are delayed when rotavirus and cryptosporidiosis are infected simultaneously compared with each agent alone. 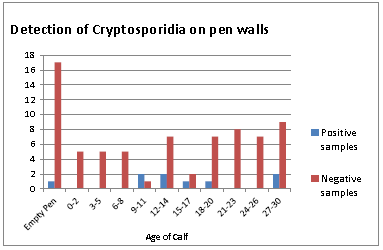 An important variable not available for Gunn et al ‘s report (2016) is new research on the importance of the genotypic strain of Cryptosporidium parvum as reported by (Thompson 2016) on the severity of clinical signs. While this is not proven in her PhD thesis the results leave open that cryptosporidial subtypes or strains differ significantly in virulence, and how pathogenic different genotypic strains may appear from a clinical perspective, notably how severe the scours (tendency to dehydrate), the loss of appetite, and period of recovery from scour can differ. 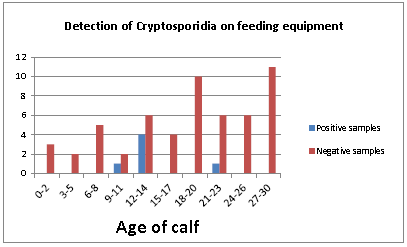 In the practical farm situation there is a lack of knowledge about cryptosporidial challenge dose rate occurring, the inability to measure ‘stress’ in the very young calf, and in general the imprecise measurement of colostral transfer while following high standards of colostrum feeding to a group of calves. Taking these variables into account it is therefore difficult to apply the results above (Gunn et al 2016) to any other farm other than the two reported on. 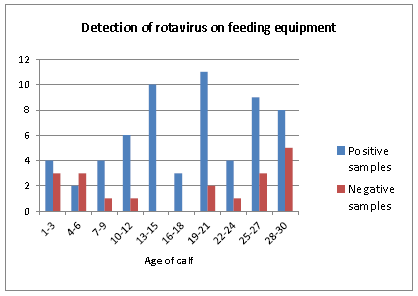 This report however does emphasise the presence of both organisms, one a virus and the other protozoan and their widespread presence in the calf rearing units from birth and in the shed environment. The use of these new tools to detect their presence is an advance in our understanding. 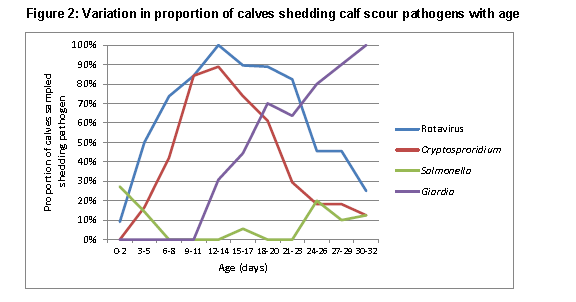 They emphasise the importance of between calf transmission in advance of clinical signs of scouring. 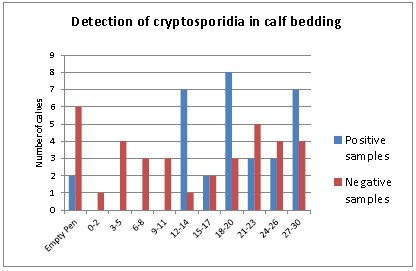 Contamination from calf infection from the dam (and fomites) at birth and a new infection expressing itself as contamination over the bedding. 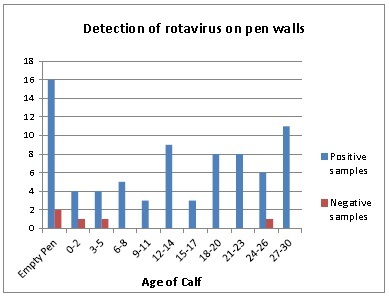 The graph below suggests that 40% of calves are excreting rotavirus from about 3 days and it is the dam and/or fomites including feeding utensils which is important.